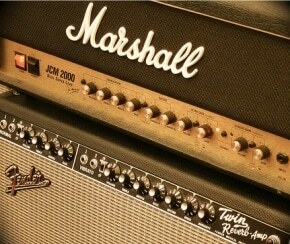 The company’s most famous and most popular amp has to be their Revolution model. It’s versatile and provides a great clean sound, and it’s the foundation of the Krank brand. The downside is that 100 watt amp has more volume than most guitarists need, and at $2,600 for a half stack, it’s a big investment. Enter the Rev Jr Pro, which, as the name would suggest, is a smaller and more economical version of the Revolution. 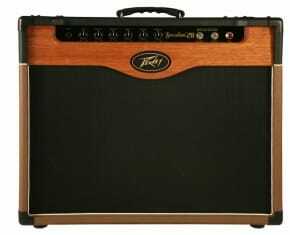 The Rev Jr is a 20 watt head that comes packed with one (or two if you go for the full stack) 1×12 speaker cabinet(s). This is about a quarter the size and output of its bigger brother, and it costs between six and seven hundred dollars. The obvious question is whether a scaled down version of the Revolution can live up to the Krank brand. We decided to put the Rev Jr Pro head with two 1×12 cabinets through its paces to see whether or not if is worthy of the Revolution name. Despite its small size, the Krank Rev Pro Jr has a rugged construction, so unlike any mini stacks, you won’t have to worry about destroying it going from gig to gig, or if you happen to sneeze in its general direction, it won’t explode. Chrome plated steel grills on the speaker cabinets and head are optional ($849), or save $50 bones and get the standard flat black version ($799); the corners are all reinforced with metal as well. You’d need to work hard to damage one of these, even if your inner Pete Townsend gets out of hand. The Rev Pro Jr has the same heavy duty knobs and potentiometers as the Revolution, and they have the same slick action. The speaker cabinets are poplar, and they feature the popular Eminence Legend speaker. Like small dogs and French generals, the Rev Pro Jr head has a bit of a complex about its tiny size, and tries to make up for it by having a buttload of useful features on the front and rear panels. On the front panel you’ve got a 3-band EQ; midrange, bass and treble EQ, and, of course, the midrange contour sweep that helped make the Krank models popular, master control, and a gain control for the Krank channel. For the Kleen channel, the lil’ monster is equipped with volume, mid, and bass controls. The Rev Jr Pro also includes a footswitch, unlike the original Rev Jr model. On the rear panel you’ve got an active tube driven effect loop, 1/4-inch returns and send jacks. The amp comes equipped with a volume and presence control so you can tweak your sounds and tones even further, there is also a push button boost switch to kick in additional gain for you high-gain extremists out there. Of course the Rev Jr Pro has all the usual goodies; two speaker output jacks, 8- and 16-ohm switch, etc. Powering the amp are two Sovtek 5881 tubes and three 12AX7 Preamp tubes. That said, it’s not perfect. The footswitch only switches channels (Krank to Kleen, Kleen to Krank), but doesn’t allow you to turn on the boost when you are ready to start shredding your solo in the middle of a song. These aren’t deal breakers for most people, but if you want to engage the boost switch during a song, well, we hope you got quick little fingers or, possibly, an extra hand. The Krank Rev Jr Pro is one heck of an amp for the size. While most small amps sound, well, small, the Rev Jr Pro can keep up with heads twice its size. In fact, the only real difference in sound between the Revolution and the Rev Jr Pro is that the Jr isn’t quite as loud, although you can work around that if you really need the extra volume. As it is, with the two 1×12 cabinets, there are very, very few stages around that the Rev Jr Pro would need more power for since you’ll likely mic it up anyhow. As far as the sound goes, the Rev Jr uses a variety of methods and tone control to boost gain, and this gives it the signature Krank tone and flexibility in texture shaping. If you’re more a country or blues player, the Kleen channel and the boost will give you the sound you’re looking for. 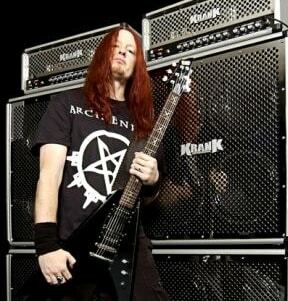 If you’re into rock and especially metal, the Krank channels is going to be your new best friend. You can get anything from grinding distortion to a classic rock sound out of it, and it does it all equally well. The distortion is rich and responsive, and it gives you the pure sound of tubes being pushed as far as they will go. 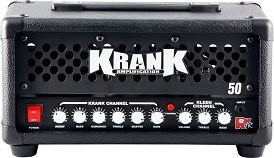 The Krank Rev Jr Pro is a mini stack that thinks it’s a big stack. 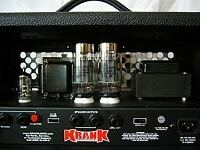 If you’re looking for a practice amp or you’re just not at the stage where laying down thousands for an amp seems like the thing to do, you can’t go wrong with Krank Rev Jr Pro. It’s cheap, it’s durable and best of all, it’s good.